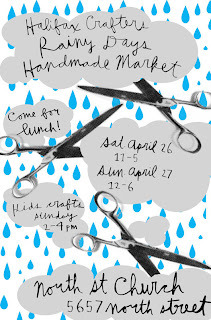 Please join us for the 'Rainy Days Handmade Market' at the North Street Church on Saturday, April 26th and Sunday, April 27th. The show times are 11-5 on Saturday, and 12-6 on Sunday, and the Church is located at 5657 North Street, at Fuller Terrace. Available for sale from over 30 vendors will be a fabulous array of made-in-the-Maritimes craft, and tasty food too! On Sunday from 2 p.m. - 4p.m. there will be a kids' facepainting and craft table to keep the little ones busy while you peruse the goods. Hey! Mother's day is on May 11, just two weeks after the market; show the most important lady in your life some crafty love.